sunday morning 6:20 am. it was this early when my alarm clock went off. bright and early i packed the car with all my stuff i gathered throughout the past weeks. 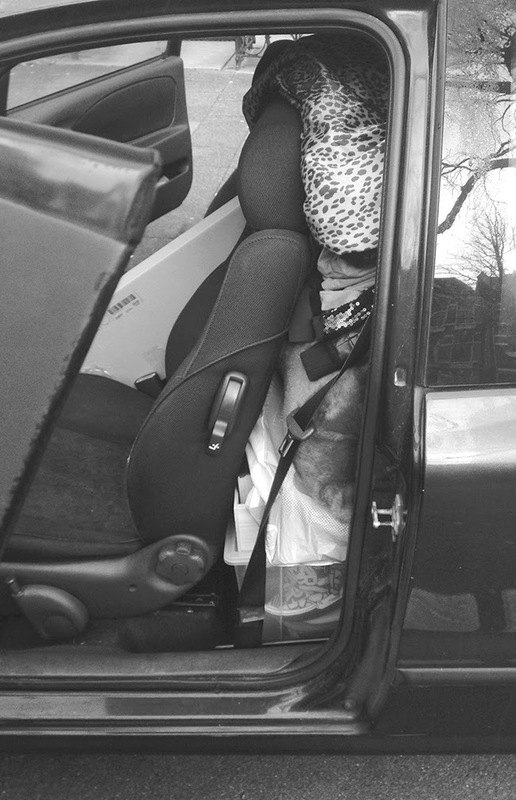 ready to pickup my friend kitsa and load up the car with her stuff. 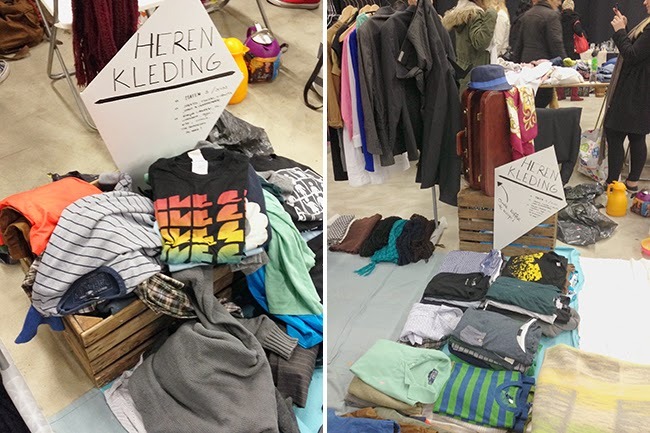 this would be our very first time selling our used goods at stadjersmarkt, the local flea market. well.... we had a blast! right from the start, while unpacking the car people were swarming around waiting to see what was going to be unpacked. we had our first bite to eat at 12 am. 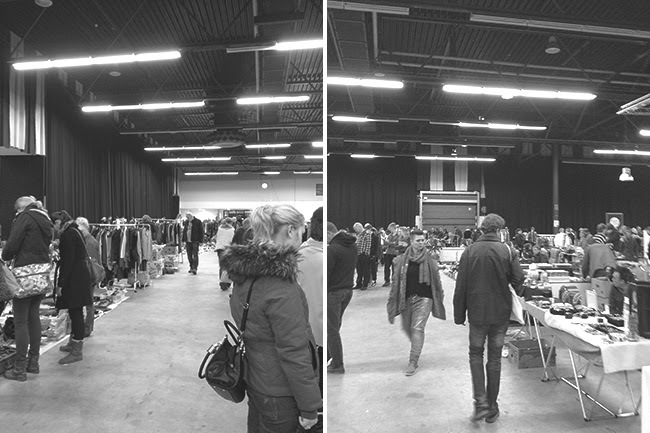 from the moment the doors opened at 10 am we were selling non-stop. start collecting your stuff on time. this way you get an idea how much you've got to sell, if it will fit your stand and your car. you will probably need it right at the first sale. put on warm and comfortable clothes. it can be chilly in these big halls. it's better to take something of than trying to keep yourself warm. when you get the chance to sit down for a moment better make it comfortable. bring your old plastic shopping bags. people appreciate it when you offer them a bag to put their stuff in they just bought from you. 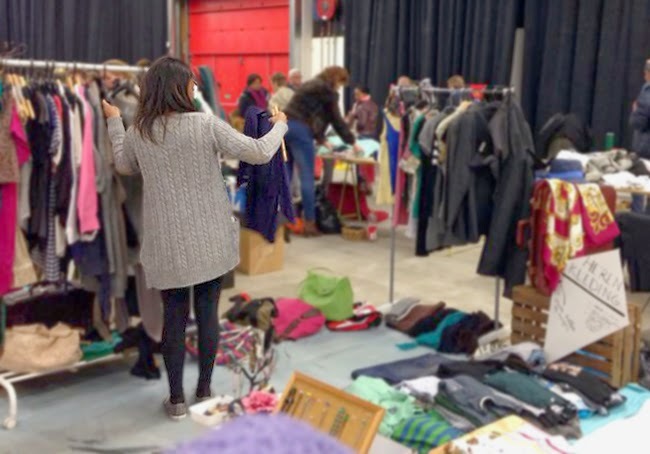 sell your 'good' clothes from a rack. we made a little boutique with two clothing racks. put things together that belong together like clothes, home ware, shoes, accessories, toys, books etc. when something is placed more in the back of your stand you can use signs to draw attention. not everything can lay in the front, you will have to put stuff a little further on the stand. because people won't be able to reach it, it's smart to make aisles so people can walk on to your stand. keep rearranging your stand during the entire day. you will quickly see what people are interested in, put it in front of the stand. if something isn't selling, try to be creative so it will be noticed. start lowering your prices 2 - 1.5 hour before closing time. watch out for counterfeit and foreign money. you can't ignore this, even at the flea market. yes, your fanny pack! maybe one of the few occasions this is allowed. we both experienced that wearing a shoulder bag with (lot's of) coin money can get heavy at some point. smile, greet and thank everyone. like true sales advisors* we are, we were working our stand just like we would when working at the store. last but not least! have fun. use price tags. people like to negotiate don't put price tags on your goods. loose your patience. you will have to deal with a variety of all kinds people. be patient. budge. if you have a price in mind and you know the item is worth it, don't budge to a lower offer. you will know, when people know your price is realistic. if it doesn't sell, take it home again. sell crap. don't sell broken or dirty stuff. sell what you would buy. start packing. don't start packing to soon. 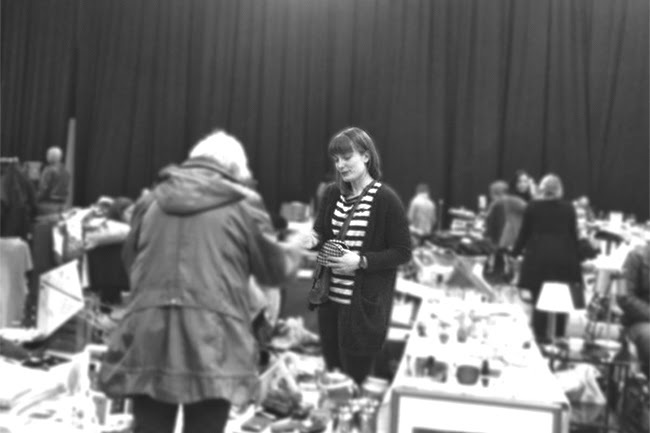 there are always people walking around in search of that last bargain. feel free adding to the lists if you have any do's and don'ts. *kitsa and i met when we were both working at h&m as sales advisors. Make your stand inviting by ading hight and variety in the way you present your goods. But always make sure the items can be easily looked at/touched/bought. And yes: make it fun!! !